Pruning is important for a variety of reasons. Pruning can help control the size of an evergreen, direct growth, or maintain plant health and appearance. Pruning can also increase the safety of an evergreen by removing broken, diseased, dead, or dying branches. In addition to pruning, selecting plants that are suited to your environment and location are very important. The ultimate height and spread, in addition to location of overhead powerlines, should be taken into account when selecting an evergreen for landscaping. How to prune specific evergreens. Evergreen trees such as pine, spruce, fir, Douglas-fir, and hemlock require little pruning. These trees typically have a broad, pyramidal form with low branches, and should be left intact. DO NOT remove lower branches as this destroys the natural aesthetic form of the tree. NEVER remove the main, central stem. DO remove crossing, dead, diseased, or broken branches. Also remove individual branches to help maintain the tree’s natural outline. When pruning large branches, use the 3-point method of pruning (refer to University of Wisconsin Garden Facts XHT1014). Pines: New growth in pines occurs once a year from terminal buds. 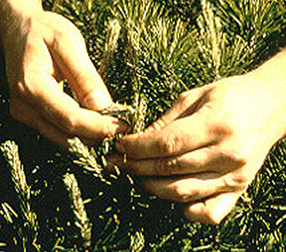 To maintain a more compact, densely branched habit, remove approximately 1∕2 to 2∕3 of the elongated terminal buds (candles) before the needles expand in spring. Candles can be pinched in half (see figure), or pruned with hand pruners. Do not cut branches back to older growth farther down the stem. 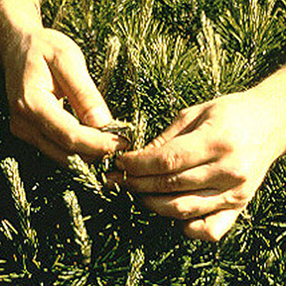 Pines produce buds only at the tips of the current season’s growth and will not produce new shoots farther back down the stem. Spruce, fir, and Douglas-fir: New growth in these trees occurs once a year from terminal buds. To maintain the tree’s natural shape and promote denser growth, cut the tip of the branch back to a lateral bud. Do not leave branch stubs. In early summer, you can also remove 2∕3 of an unbranched tip to keep the tree fuller. Hemlocks, arborvitae, and yews: These evergreen trees and shrubs have latent (dormant) buds farther back down the stem. Therefore, you can shear these evergreens in late spring or early summer after new growth has expanded. You can also prune them in spring before the new growth has expanded because any subsequent growth will hide the pruning cuts. You can also prune individual branches back to a bud or a branch to encourage more compact habit. If these evergreens are used in formal hedges, maintain the base of the hedge wider than the top to insure adequate light penetration to the bottom of the hedge. Junipers and false cypress: These shrubs require little pruning. They have scale and awl-like foliage that can be tip pruned in summer. Selectively prune branches of these plants back to a side branch, so that pruning cuts are hidden under foliage. These plants should NOT be sheared or cut back to older, non-leafy areas because this type of pruning would take years for new growth to conceal. Do not prune these plants after August, as the new growth will not harden off sufficiently before winter. For more information on pruning: See UW-Extension Bulletins A1817, A1771, A1730 and Extension Fact Sheets XHT1014, XHT1015, or contact your county Extension agent.